This could possibly be the most amazingly delicious burritos I have ever had, irrespective of with or without meat. 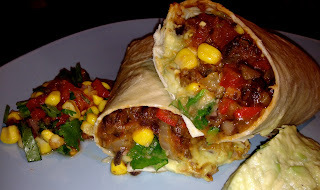 I thought I might miss cheese with this, but didn't at all, they are so full of flavour, with rich refried black beans, spicy corn salsa and lemony guacamole. Promise me you'll try this, ok? Regarding milk, currently trying a lot of different non-dairy milk options, will come back to this in a later post. Tack för tipset! Är ingen matsnobb på det stora hela men när det gäller mexikanskt vill jag hålla mig långt ifrån färdiga kryddmixer (med ton av spiskummin). Ingen snabblagad mat med andra ord men ack så mycket godare. Det här ska testas mycket snart. Ja, testa :)Gillar inte heller kryddmixer, tar ju knappt langre tid att ha i sina egna kryddor. Det har receptet gar dessutom ratt snabbt iaf nar man val skurit och forberett allt. Lycka till och beratta hur det gick! Great burritos! We couldn't find any chipotle but everyone was overwhelmed at the dinner anyhow. I agree on everything about not missing cheese or other dairy products or meat. Will definately try some of the other recipes as well. What about vegan desserts? We made a key lime pie as dessert for this dinner. Can one do something similar to those kinds of desserts, cheesecakes etc,(what substutites are there then for e.g. eggs as a binder) or do one just have to think outside the box and make other stuff? I'm so happy you liked the burritos! No experience with vegan desserts yet but will have a go making some later. I think you can make quite a lot of desserts and cakes without dairy and eggs, I know I've seen recipes using soft tofu or coconut milk in vegan cheesecakes for example.